My Great-Grandmother always looked forward to our Christmas visit. Her large metal TV tray was fully stocked with candy and munchies. She'd take the plastic wrap off the bowls when we arrived. The first portion of the visit was catching up on life's happenings. We always brought gifts for her, however, before she opened them, she'd take my brother and I into her bedroom. Neatly laid on her bed and dresser were handmade mittens. Dozens to choose from. All different sizes. We each got to pick out a pair. That was her gift to us. She was proud of her mittens. Throughout the year she'd make them. Then, for Christmas, she'd give them as gifts to her grandchildren and great-grandchildren. Now, decades later, I wish I had kept those mittens. It's something I have thought a lot about as of late. 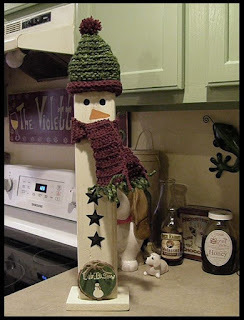 This year, one of our Bodacious Holiday DIY Dog Mom Projects were snowmen. We made a dozen 12 inch snowmen. The hats and scarves were made of fabric. You can check those out here. For our Bodacious 12 Days of Christmas, we made a few more snowmen. Different styles. And because we only made 1 or 2, I wanted to do something different. Instead of fabric hats and scarves, I decided to crochet them. It had been years since I had crocheted. I know the basics. Scarves. Hats. Blankets. Surprisingly, it didn't take long to get back into the swing of things. The mini hats and scarves for the snowmen came out adorable. I even made pompoms for the tops of the hats. As I busted out the hats and scarves for the snowmen, several things happened. 1. My yarn addiction resurfaced. I now have a full shelf of yarn plus a gigantic whicker basket filled. When I visit a store that sells yarn, I can't leave without visiting the yarn section. 2. I decided to make really cool scarves. A few people on our Christmas list who appreciate handmade gifts will have handmade scarves in their Christmas baskets. And, by request, I'm also making Lisa a scarf and hat. She only has 1 hat. It's pink. It served its purpose last year, but she hates the color. 3. I need to curb my urge to make crocheted throw blankets. Crocheted blankets and furry kids don't mix. It's a danger for so many reasons. So, we'll have to stick to quilted blankets in our household. But, I can make them for other people. All in all, I'm loving my rekindled adoration for crocheting and the memories creeping out of the woodwork. It's a relaxing hobby. One that produces warmth for the recipients. While I don't have any of the mittens my Great-Grandmother made, in sense, I'm carrying on a little part of my family history.